In last month’s tip I showed you each of the different options available to members for viewing plans on the Builders Exchange IPIN system. This month I’m going to focus on one of those options: the IVS Lite Viewer. The IPIN Viewing System (IVS) Lite Viewer is a simple online plan viewer. 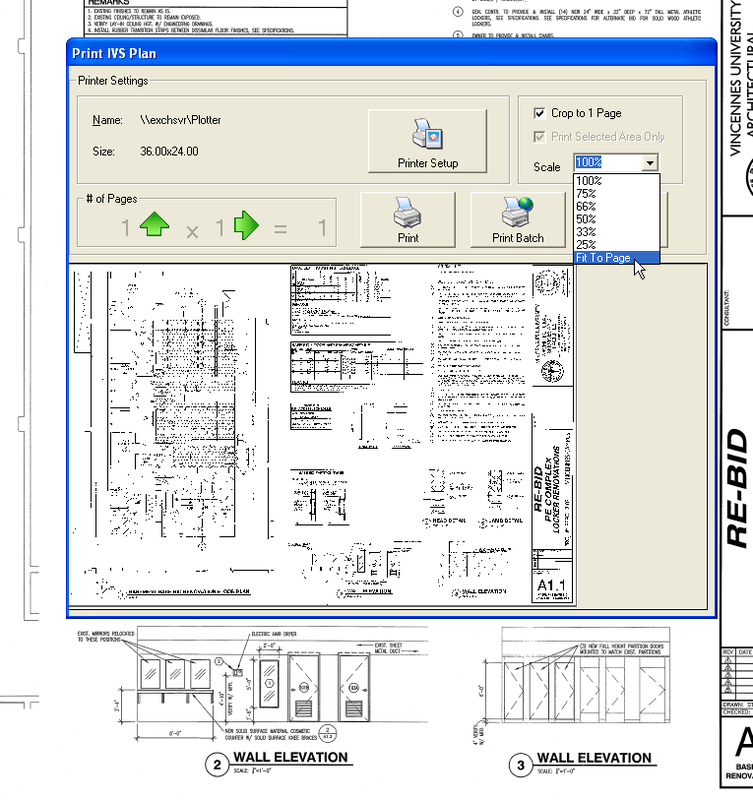 It supports viewing, printing and saving of plans. It is available only to members with an upgraded membership*. The Lite Viewer is only compatible with the Internet Explorer browser. Mozilla Firefox, Google Chrome, and Safari are not currently supported. *For those who are unsure if you have the upgrade: if you have the ability to download specs, drawings, and addenda or if you can see multiple options for viewing plans, then you have the upgrade. The dimensions of the plan page are also visible on top and left margins of the plan. Most plans are either 24″ x 36″ or 30″ x 42″. Clicking and dragging the zoom select tool. The zoomed in area after using the select zoom tool. To zoom in or out of the area you are already viewing, use the first two tools at the top left marked “In” and “Out”. To zoom out to a full view of the entire plan, use the “Normal” tool. The “Magnify” tool can be used to magnify a very small area of the blueprint by clicking and holding in the left mouse button as you move the cursor over the areas you want magnified. This is a quick way to read a section of the plan without having to fully zoom into that area and then zoom out again. 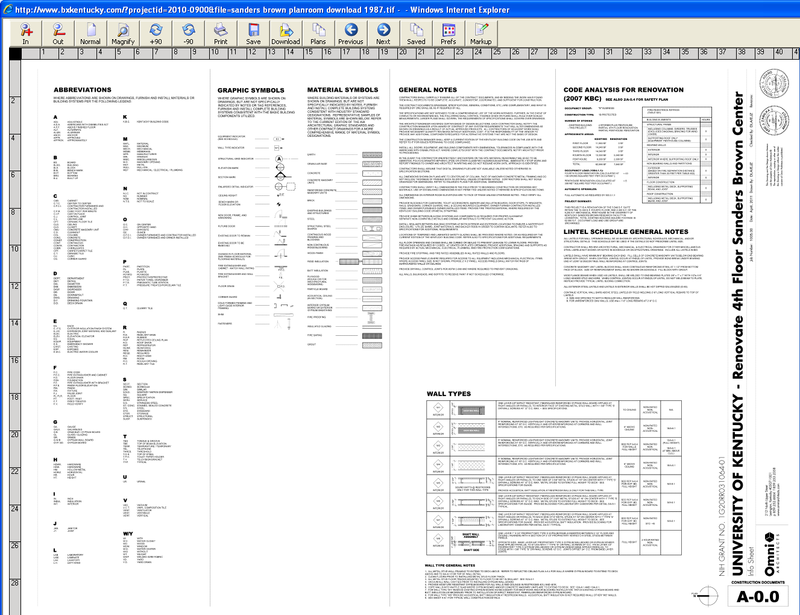 Magnifying text on the plan using the magnify tool. The +90 and and -90 tools rotate the drawing 90 degrees right or left. 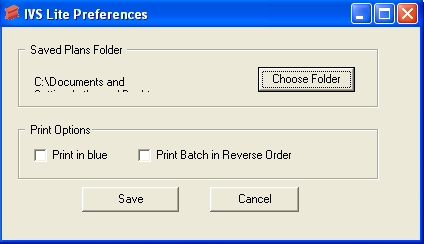 Choose “Printer Setup” to choose your printer and paper size and then click “Print” to print. Note that printing plans on smaller-sized paper will not be to scale. To batch download multiple plan pages, use the “Download” button. This will bring up a list of every plan for the project. Multiple plan pages can be selected by clicking and dragging or by holding down the Control button on your keyboard and left clicking/highlighting every plan needed. Clicking “download” will save allhighlighted plans. All plans are saved as TIFF files. To change where the files are saved on your computer, go to “Prefs” and click “Choose Folder”. Select the directory you would like to save your plans to and click “OK”. Then click “Save” in the IVS Lite Preferences dialogue box. NOTE: Sometimes the “IVS Lite Preferences” dialogue box can “disappear” behind the current window being viewed on your computer. Simply minimize the Lite Viewer to find the dialogue box and choose “Save” to complete the directory change. 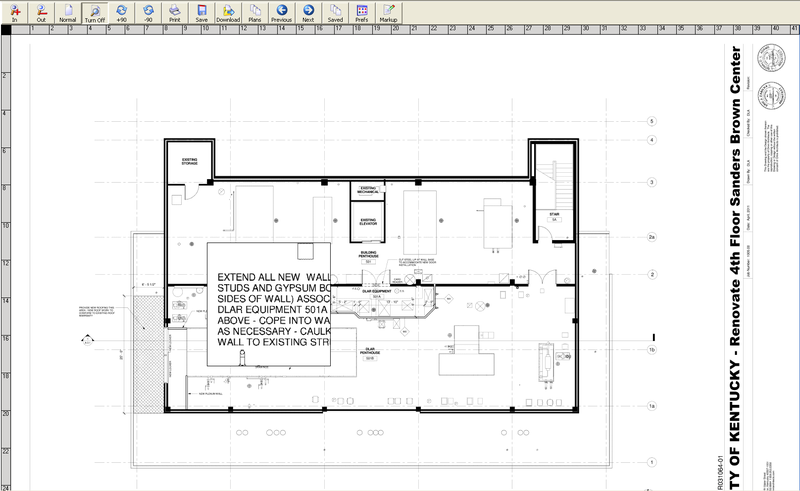 To navigate to any plan for the project without closing the Lite Viewer, click on the “Plans” tool. 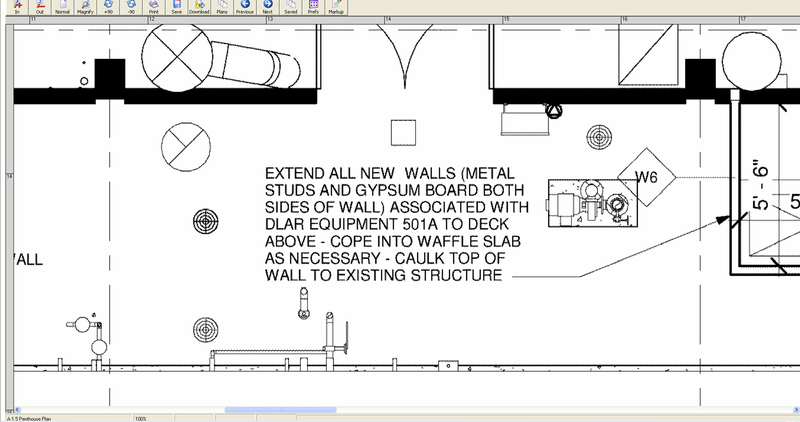 This will show an expandable list of each section of drawings. 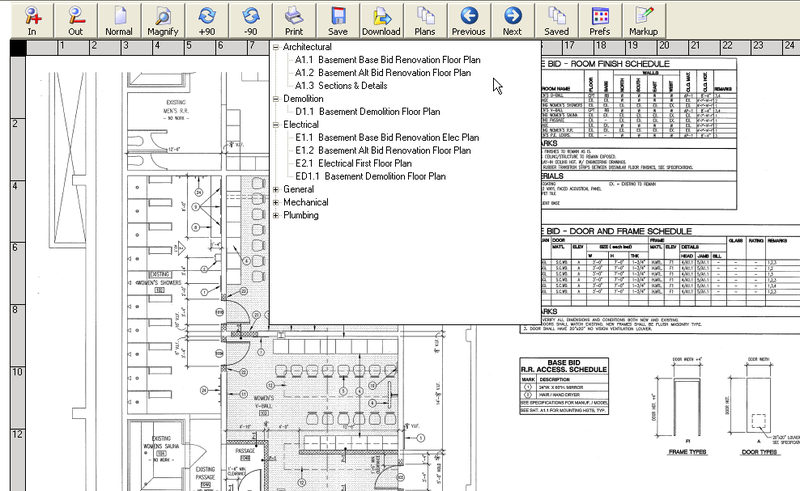 Clicking on the plus sign to the left of each plan will list each plan for the section and double-clicking on a plan willl access it in the Lite Viewer. The “Previous” and “Next” tools will jump to the previous or next listed drawing of the project. Finally, the “Saved” tool will bring up an expandable list of each drawing you have saved on each project. You can jump to each drawing listed, regardless of which project you are currently viewing. 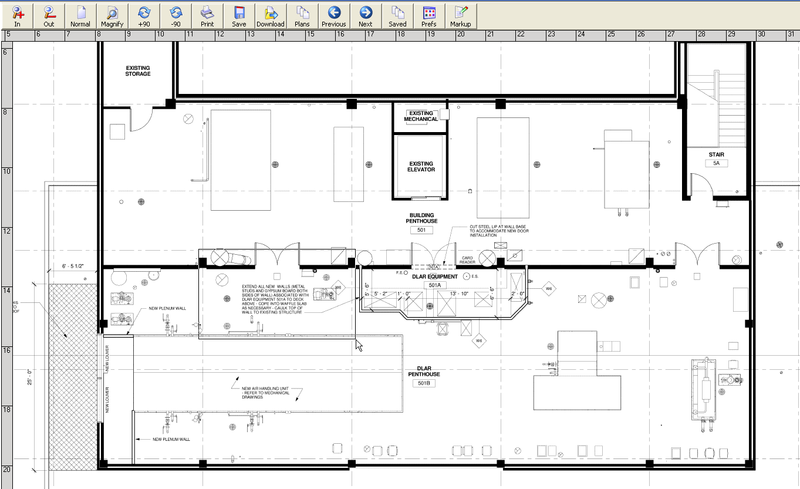 The Lite Viewer is a quick, efficient way to view plan details, print plans, and save copies all online. Next month I will begin a 2-part series on the IVS Pro Viewer, which gives members the ability to take measurements and markup plans online. You can also join us for free online training on Thursday, July 19 from 10-11:30 a.m. The next training sessions will be held on July 20, 2012 (Louisville) and July 27, 2012 (Lexington). Call me, Aaron Thomas, at (502) 459-9800 or e-mail athomas@bxkentucky.com to RSVP for training, either online or in person or fax this form to (502) 459-9803.